The catalyst for the short-lived Ford XY Falcon 4×4 ute was the Australian Army, according to the late Howard Marsden, who was head of Ford Special Vehicles at the time. In an interview conducted in 2001, Marsden said that the four cylinder-powered Land Rovers being used by the Army at the time were proving to be toounderpowered, given that they often had to lug heavy payloads of troops and equipment and cover huge distances. So in the late 1960s, the Army put out a tender to local manufacturers for expressions of interest in building a new 4×4 light truck with a more powerful six cylinder engine that could out-perform their Land Rovers. Given the potential for large volume government fleet sales for the successful tenderer, Ford decided it was a challenge worthy of tackling. They certainly had the facilities and specialised knowledge to have a decent shot at it. Ford’s assembly plant in Brisbane already handled the finicky local assembly of imported 2WD F series trucks that required a fair degree of improvisation on the production line. And for several years the Brisbane plant had been collaborating with Willys Motors (the local importer of Jeeps) in supplying complete engines and numerous other Falcon parts like clutches and pedal assemblies required for local assembly of CJ5/CJ6 Jeeps. These resources, combined with the product planning expertise of Ford Special Vehicles, made Ford well placed to tackle such a program. In fact Al Turner, Marsden’s predecessor, had already played a key role in development of Ford’s Fiera light truck for the burgeoning Asian market. Given Ford’s existing ties with Willys Motors, it was decided that the easiest and most cost-effective answer to the Army light truck tender was to convert the existing six cylinder XY Falcon ute into a 4×4 version, using proven Jeep drivetrain hardware and transmission adapters etc that already existed for the CJ5/CJ6. The greatest engineering challenge Ford faced was to install a complete leaf-sprung live axle assembly under the front of a Falcon ute that was never designed for such things. Marsden recalled with some dismay how difficult this task proved to be, as the Falcon ute featured the same unibody construction (body and chassis combined as one unit) as its sedan sibling rather than the traditional and much stronger body-on-ladder-frame design employed by Land Rover and other 4×4 manufacturers. As a result, new mounting points for the front leaf springs fabricated from steel plate had to be welded directly to the bodyshell’s underfloor. High-lift leaf springs and shocks raised the rear end of the utility to match the newly raised front end. Another challenge was providing enough clearance between the front axle and the engine’s sump and exhaust system to allow for adequate suspension travel. The simple solution was to make new engine mounts that slanted the engine over to the right by several degrees. This tilt was large enough to provide adequate sump-to-axle clearance, but it also required a wedge-shaped spacer to be fitted between the carburettor base and inlet manifold to compensate for this angle change and maintain the correct static float bowl levels. Don’t worry how it looks, just make it work. The in-line six had to be slanted to the right to allow clearance between the sump and front diff. Note the extra bracing that tied the firewall to the shock absorber towers for extra chassis strength. The Falcon’s 250 cid (4.1 litre) inline six had plenty of performance on tap, with 155 bhp (116kW) @ 4000 rpm and maximum torque of 240 ft/lbs (325Nm) available from a very low 1600 rpm. A heavy duty 10-inch dry plate clutch, Borg Warner AS5 T15A three-speed full-synchro gearbox with floor-mounted Jeep gearshift and a Spicer Model 20 two-speed transfer case also with floor lever control got power to the front and rear wheels through one-piece propeller shafts. Brakes were 11 x 2-inch drum brakes all round (typical fare for 4x4s of this era) with 16 x 4.5 inch steel rims on skinny 6.00 x 16 all-terrain tyres. Ford also developed some useful accessories including a powerful 8000 lb PTO winch (shaft-driven from the transfer case), a heavy duty tow bar and military-style high canvas canopy to cover the load area. With a kerb weight of only 3620 lbs (1642 kgs), a useful payload of 1380 lbs (625 kgs), excellent approach and departure angles and a lateral tilt angle up to 45 degrees, the Falcon 4×4 ute had impressive cross-country performance and a high torque-to-weight ratio with or without load due to its relatively light unibody construction. Not that any of this mattered to the Army, because the military never got to the stage of even field-testing Ford’s prototype, Marsden revealed. He recalled that during the vehicle’s development, the Army made it clear to Ford that even though the basic concept was right, it was never going to meet their extreme battlefield requirements without the proven strength and durability of a traditional body-on-frame construction. Clearly this was a path Ford did not have the resources to follow, which was probably just as well because after seeing what else was (or wasn’t) available, the Army opted for Land Rover’s more powerful six cylinder version. Fortunately Ford’s work on the local Army truck tender didn’t go to waste, as public interest in the 4×4 ute was enormous after ‘spy’ photos of it being tested at the company’s vast vehicle proving ground at You Yangs in Victoria appeared in local motoring magazines. Marsden said that it was purely public demand that swayed the company bean-counters to approve the XY Falcon 4×4 ute for series production, which he said also created an instant new market segment for Ford. To understand the public clamouring for this ‘cross-over’ type of vehicle, one has to realise that Australia’s national road network in the early 1970s featured a lot more dirt roads than today and the noisy, rough-riding 4×4 vehicles of the era were nothing like the luxurious leather-lined SUVs we now take for granted. So with the need to haul loads across vast poor quality roads in comfort, the appeal of this new hybrid vehicle that combined a half-tonne plus carrying capacity and four wheel drive with many of the creature comforts of a modern sedan, was understandable. But there were serious structural problems which had to be solved first, because the standard Falcon ute body was not designed to cope with the high suspension load paths it was being subjected to as a 4×4 vehicle. According to Marsden, body stress fractures resulting from rigorous off-road testing prior to production showed that the front end would need to be beefed up to cope with the pounding dished out by the heavy live axle crashing around beneath it. Note metal frames stretching forward from the firewall on each side to boost front chassis rail strength. These frames also restricted steering lock, resulting in this vehicle’s notoriously large turning circle! Note also the spring hangers made from steel plate and axle clearance for the sump and exhaust created by slanting the engine to the right. Narrow shaft with uni-joint is the driveshaft from the transfer case for the Power Take Off (PTO) winch. Ford came up with some effective – if fairly crude – engineering solutions. Light steel frames (hidden beneath the front mudguards) spanned from the firewall forward to the radiator support panel on each side to add much needed strength and rigidity to the chassis rails. Another brace, fabricated from several peices of u-section steel plate welded together, tied each front spring tower rigidly to the firewall. The pre-production testing also showed that the bodyshell wasn’t the only thing that needed beefing up, as the original Dana front axle chosen for the project also proved it was not up to the task. A heavier Dana unit with stronger 3300 lb axle capacity was specified for the production model. The standard Falcon ute’s Borg Warner rear axle was retained, as its 2000 lb axle load rating was adequate for the task. 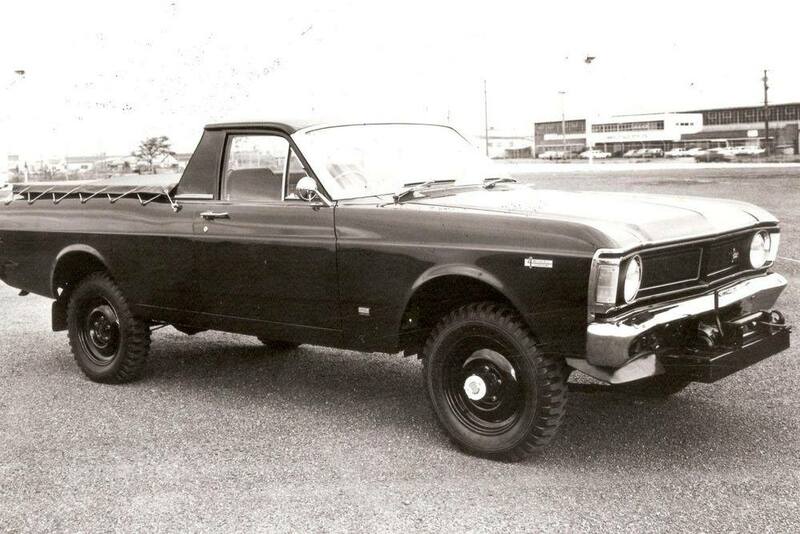 By this stage of the 4×4 ute’s development in mid-1971, the XY Falcon range (launched in October 1970) was approaching the end of its production run, with the all-new XA model due for release in March 1972. Ford set aside a batch of 432 XY Falcon ute bodies (the reason for this unusual build number is not known) that were earmarked for the 4×4 production run in the second half of 1971. According to Ford workers, those XY ute shells actually remained stockpiled in the backyard of the Brisbane plant for almost a year, as ordering and delivery of the new Dana front axles from the US caused crippling delays. By the time the imported front axle units finally arrived, the new XA Falcon range had been on sale for months, which would present a real challenge to dealers trying to sell a superseded XY Falcon ute as a ‘new’ offering alongside the latest swoopy XA model (below). However, given the amount of time and money the project had already consumed, it was decided to push ahead as Ford figured typical Falcon 4×4 ute buyers would be pragmatic mostly rural types that wanted them more for practical reasons than appearances. Marsden recalled that each of the 432 XY 4×4 utes produced at the Brisbane plant were essentially hand-built. They also had to be assembled on weekends by a dedicated team of workers, as each vehicle required the fitting of unique parts that would have disrupted the flow of normal plant production lines during the working week. And given the unplanned model overlap, they also scored some XA parts during their construction including the high back bench seat with integral head rests, column-mounted ignition key/steering column lock and screen-bonded rear view mirror. 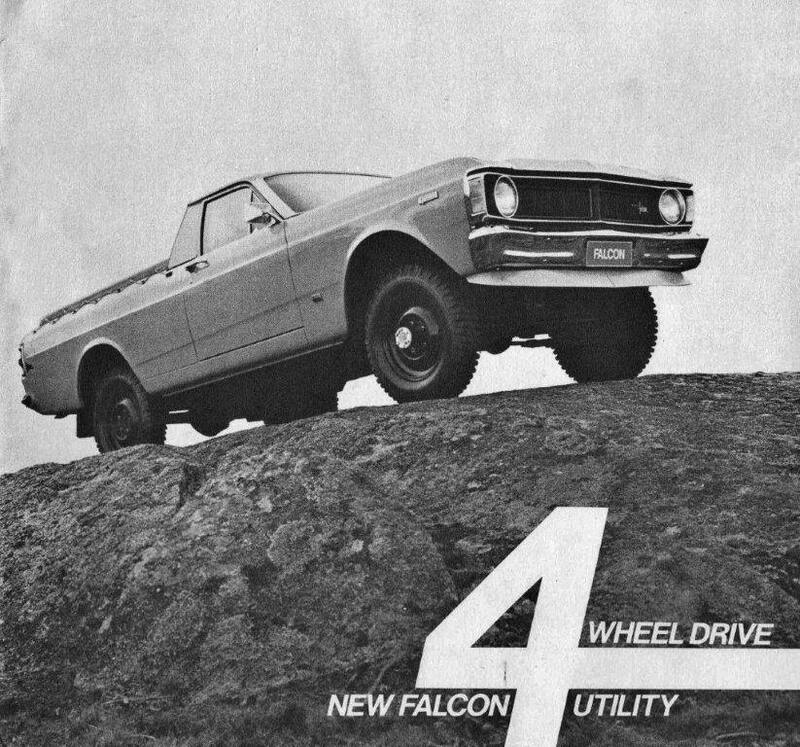 When the 432 XY Falcon 4×4 utes finally went on sale in early 1973 (some say late 1972) for a base price of $3680 with full 12,000 mile/12 month factory warranty, there was considerable pent-up buyer demand and Ford sold every one of them. It was the best get-out-of-jail card FoMoCo could have played. The XY Falcon 4×4 ute was head and shoulders ahead in performance, comfort and features when compared with the agricultural Land Rover, Land Cruiser and Nissan Patrol offerings at the time. For here was a rugged all-terrain light truck that not only offered a load area that was superior to its 4WD cab-chassis competitors, but its standard equipment list included a tonneau cover, sump guard, dual exterior rear view mirrors and a tinted laminated windscreen for starters. 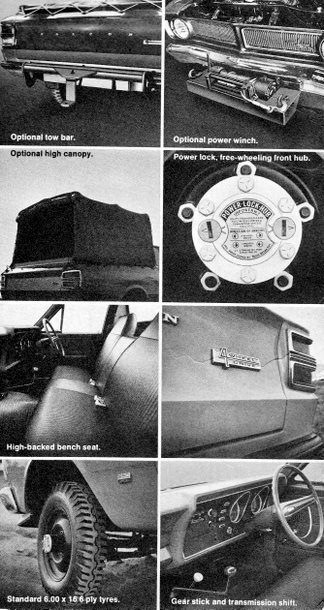 Occupants enjoyed lots of sedan car features inside, too, which were unheard of in rival 4×4 trucks. These included door-pull arm rests, padded dual swivelling sun visors, swivelling quarter-vent windows, padded dash panel, full ‘airflow’ cabin ventilation, collapsible steering column, ignition and steering column lock, two-speed heater/demister, two-speed electric windscreen wipers and washers and tasteful saddle trim upholstery. Factory options included a winch, tow bar and high military-style canopy. You could even request a dealer-installed Falcon GT front spoiler and several vehicles (including the one featured in the sales brochure) had one fitted. Not that it did anything remotely aerodynamic at that height –it just looked good. The front axle was also fitted with a pair of Warn ‘Power Lock’ free-wheeling hubs which were just starting to appear in the aftermarket. With the turn of two small keyways on the face of each hub (you had to have a screwdriver or small coin handy) these hubs disengaged the wheels from the front drive axles. This handy feature saved fuel and lots of unnecessary wear and tear on the drivetrain when four wheel drive was not required. And in this vehicle’s case, that would have been most of the time. Despite widespread demand from the public and motoring press to continue the 4×4 ute program with the XA model and beyond, Ford called it quits. Numerous theories have abounded over the past four decades as to why, including claims that the 4×4 design could not meet tough new ADR crash safety standards, or that the new XA body design with its long door openings was not rigid enough. According to Marsden, though, the decision not to continue was determined by the same accountants that had approved the XY production run. It was simply that Ford lost so much money on the Falcon 4×4 ute program that to start all over again with the XA just did not stack up as a sensible business case. However, what the XY program did do was alert Ford to growing local demand for the more luxurious breed of 4×4 light truck that was doing big business in the US, as part a boom in what the Yanks were calling ‘recreational vehicles’ or ‘RVs’ for short. The answer was to start imports of the 4×4 version of Ford’s popular F-series truck from the US, at a much higher price premium, to satisfy that market need. Which it did brilliantly of course. And, through private import companies, continues to this day. And we can thank the XY Falcon 4×4 ute for playing a part in that.